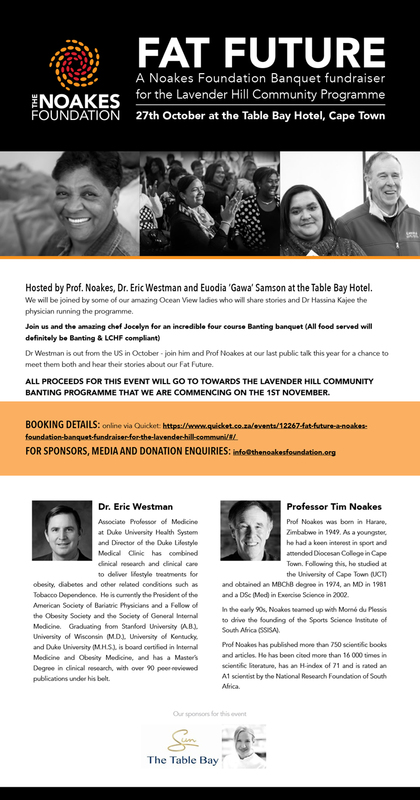 Hosted by The Noakes Foundation, Fat Future: A Banquet Fundraiser takes place on Tuesday 27 October at the Table Bay Hotel in Cape Town. This special evening will be the last public talk of the year offered by Prof Noakes. Joined by Dr Westman they share their stories and reveal more on what our Fat Future currently looks like, and ways to change this for future generations. In addition, some of the amazing Ocean View programme participants will also share their stories along with Dr Hassina Kajee, the physician running the programme. Following the recent success of the six-week project in Ocean View, Fat Future – A Noakes Foundation Fundraiser aims to raise R1.5 million to extend the community programme, EAT BETTER SOUTH AFRICA! into Lavender Hill. All proceeds raised at this event will go to this programme, which is earmarked to commence on 1 November. Be part of this inspiring initiative, book now at Quicket (www.quicket.co.za) to reserve a seat or table. There are also limited individual tickets available for those who would like to be seated at the table of Prof Noakes and Dr Westman. Eric Westman combines clinical research and clinical care regarding lifestyle treatments for obesity, diabetes, and tobacco dependence. He is internationally known for his work on low-carbohydrate nutrition. He is currently the President-Elect of the American Society of Bariatric Physicians, and a Fellow of The Obesity Society and the Society of General Internal Medicine. He has over 75 peer-reviewed publications in the fields of obesity, low-carbohydrate nutrition, and tobacco dependence. Dr. Westman was recipient of the Society of General Internal Medicine Associate Member Award for Outstanding Scientific Presentation and Internal Medicine Resident Teaching Award. He is a former Fellow of the North Carolina Governor’s Institute on Alcohol and Substance Abuse. He received the ASBP Bariatrician of the Year award in 2010. Prof Noakes was born in Harare, Zimbabwe in 1949. As a youngster, he had a keen interest in sport and attended Diocesan College in Cape Town. Following this, he studied at the University of Cape Town (UCT) and obtained an MBChB degree in 1974, an MD in 1981 and a DSc (Med) in Exercise Science in 2002. In the early 90s, Noakes teamed up with Morné du Plessis to drive the founding of the Sports Science Institute of South Africa (SSISA). Prof Noakes has published more than 750 scientific books and articles. He has been cited more than 16 000 times in scientific literature, has an H-index of 71 and is rated an A1 scientist by the National Research Foundation of South Africa.